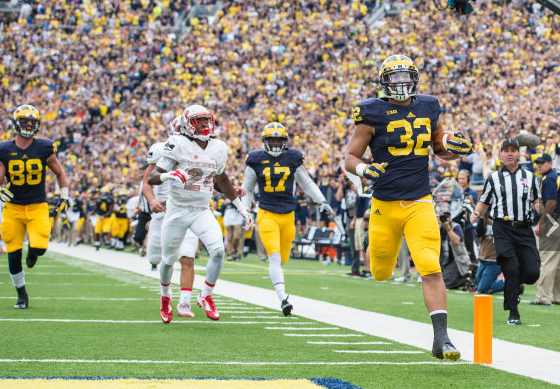 ANN ARBOR, Mich. – UNLV left Michigan Stadium Saturday afternoon with what many predicted before the season … an 0-3 record, not to mention a tidy $1 million paycheck. But unlike a lot of years when the Rebels played prestigious Power 5 Conference teams on the road for big paydays, the 28-7 loss to Michigan also earned UNLV something that has been lacking around the program recently: respect. The Wolverines (2-1), challenged by Harbaugh earlier in the week to not overlook the Rebels (0-3) despite being favored by almost five touchdowns, responded by building a 21-0 halftime lead and then cruised home to victory before a crowd of 108,683, the largest ever to witness a UNLV football game. Junior running back Ty Isaac rushed for a career-high 114 yards on eight carries, including a 76-yard touchdown run, to back a strong defensive effort by the Wolverines. Senior wide receiver Jehu Chesson and senior fullback Sione Houma each added touchdown runs and junior running back De’Veon Smith caught a 5-yard touchdown pass for Michigan. Senior quarterback Jake Rudock completed 14-of-22 passes for 123 yards and a touchdown but also was intercepted for the fifth time in three games, this time by Rebel corner Fred Wilson. The Wolverines finished with 377 yards, including 254 yards rushing, while limiting UNLV to 235 yards, including just 111 over the first three quarters. The Rebels managed just 92 yards rushing on 36 attempts. Michigan held the Rebels to just 93 total yards in the first half while building its 21-0 lead. UNLV didn’t cross midfield until the final play of the first half when fullback George Naufahu scampered 18 yards to the Michigan 49. Rebels starting quarterback Blake Decker, listed as questionable heading into the game after limping off the field at the end of the first half of last week’s 37-3 loss to UCLA with an obturator internus strain near his hip, started but struggled, completing 8-of-16 passes for 96 yards, one touchdown and two interceptions. Decker’s first pass of the game was intercepted by cornerback Channing Stribling, who returned it 30 yards to the UNLV 32-yard line. Seven plays later, Rudock connected with Smith for a 5-yard touchdown to give the Wolverines a quick 7-0 lead. Michigan made it 14-0 early in the second quarter on a 36-yard end around by Chesson. Isaac, a transfer from USC, then broke free for a 76-yard touchdown run off left tackle a few minutes later to make it 21-0. Michigan upped the margin to 28-0 on a 1-yard plunge by Houma with 11:31 remaining. UNLV broke the shutout five plays later when Decker hit sophomore wide receiver Devonte Boyd with a 6-yard touchdown pass. The duo had also teamed up for a 53-yard completion a few plays earlier. UNLV now returns home to host an Idaho State (1-2), an FCS school that lost 52-0 at Boise State on Friday, on Saturday night at 6 p.m. at Sam Boyd Stadium.